Georgia Tech @ Clemson (ESPN): I will actually be at this game. Not really sure what to expect here. Will Clemson be rejuvenated with a new coach and, presumably, a new offensive philosophy? Will the mobility of Willy Korn make up for the huge deficiencies in their offensive line? (Also note that GT has one of, if not the best defensive lines in the ACC.) Too many variables here, and I just hope that GT will play through a surely re-energized fanbase and get the job done. Purdue @ Northwestern (ESPN2): NU got their first loss of the season last weekend against Michigan State. Meanwhile, Purdue has lost 3 straight and has failed to beat a single BCS opponent. Have to go with Northwestern here. Wisconsin @ Iowa (BTN): Wisconsin. Next! Texas Tech @ Texas Agricultural and Mechanical (FSN): Anyone noticed how bad TAMU is this year? Seriosuly. TTU rolls. Wake Forest @ Maryland (Raycom/Gameplan): Which Maryland is going to show up this week? Beats me! For the sake of my sanity, I’m picking Wake and moving on. Nebraska @ Iowa State (Versus): Bad Big 12 matchup of the day! Both these teams are winless in the conference and Nebraska has lost 3 straight. Nebraksa has a narrow overtime loss to Texas Tech last week, while ISU lost by 28 to Baylor. I like the Huskers here. Vanderbilt @ Georgia (Raycom/Gameplan): My brain says UGA but my heart is hoping for a repeat of 2006. This game will be close, for awhile. 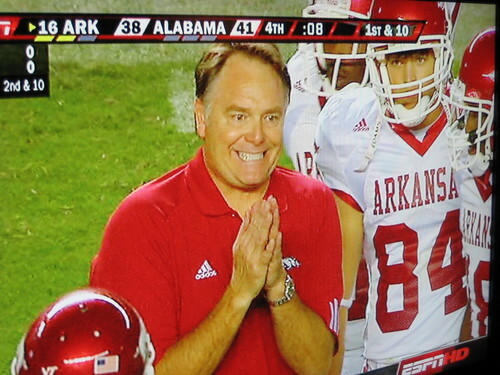 Then, eventually, Houston Nutt will find a way. A way to lose. North Carolina @ Virginia (Gameplan/ABC/ESPN2): I’m not buying into the UVA hype just yet. They may have themselves a QB, and UNC is missing some crucial parts. I still think they pull it out in Charlottesville, though. Ohio State @ Michigan State (ESPN/ABC): Important game for OSU on the come back trail, yet again. But to be completely honest I don’t know who can beat them on their remaining schedule except for Penn State. Which, notably, is next week. So the only way OSU loses is if they overlook MSU and are preparing for Penn State. Kansas @ Oklahoma (ABC/Gameplan): Is Kansas a good football team? Yes. But are they as good as Oklahoma? No. Southern California @ Washington State (FSN): Wazzou is really, really, really bad. USC should be able to beat these guys with their backups. Pittsburgh @ Navy (CBSCS): Despite, you know, the entire season I am not really sold on Pitt at all. So I’ll take Navy and the upset. 4:30: Michigan @ Pennsylvania State (ESPN): As you can tell, I’m tired and writing these previews with even less analysis than usual. My apologies. At any rate, has Michigan looked bad these past two weeks or what? Penn State rolls into their huge game against OSU next week. 7:00: Oregon State @ Washington (Versus): Does OSU hang 66 like they did on Wazzou last week? Maybe, but it will probably be more in the 40-50 range. Missouri @ Texas (ABC): Is this game as significant as it looked to be last week? Probably not. But is it still important? Yes. However, with the game in Austin I have to favor the Longhorns. Louisiana State @ South Carolina (ESPN): Don’t look, but USC has won 4 straight. The reason why you shouldn’t look is because they haven’t beaten anyone of note. In fact, I won’t even say who, that’s how unnoteworthy they are. LSU should roll. Virginia Tech @ Boston College (ESPN2): GT badly, badly needs VPI to lose this game. For reasons I can’t quite figure out, VPI is actually a slight underdog here, but I’m not buying. I think VPI will win, though I’ll be rooting for BC. Indiana @ Illinois (BTN): Hey, it’s exactly kind of game that should be on the Big Ten Network! And that’s why I’m not going to watch it. Illinois wins. Texas-El Pas @ Tulsa (CBSCS): Tulsa scores 60 and wins. That’s all for now. Bowl predictions probably won’t be up until Monday evening, but I’m looking forward to getting back on that old horse. This entry was posted in college football, On TV This Weekend on October 17, 2008 by ASimPerson.